Do Sphinx-like monuments and water irrigation systems point to the existence of an ancient civilisation on Mars? Among a great many other conspiracies, NASA is being accused of ‘covering up’ what it really knows about the red planet, reports Michel Cruz. In July 1976 NASA’s Viking 1 spacecraft was put into orbit around Mars, on a seemingly standard mission to look for suitable landing sites for the impending Viking 2 mission. As its cameras scanned the red planet’s surface, however, they suddenly came across a feature so incredible that it would not only spark off a sensation, but also a legion of fanciful hypotheses about life on Mars. The images beamed back to earth by Viking Orbiter 1 were of a land form that so strongly resembled a human face, complete with eyes cast in shadows, a narrow nose and frowning mouth, that to many it had the unmistakable appearance of an Egyptian Pharaoh. And so the mysterious ‘Face on Mars’ was born, capturing the attention of millions across the world and completely overshadowing what had started as a scientific probe into the mysteries of our nearest planetary neighbour. To say that NASA’s Mars programme has been ‘hijacked’ by the Face on Mars is no overstatement. The famous ‘face’ inspired a flood of books, theories and even starred in a movie. Before long, the little ‘green men’ of classic science fiction were back in the picture and anything from Atlantis to Egyptian and Mayan pyramids was linked to an ancient civilisation on Mars. 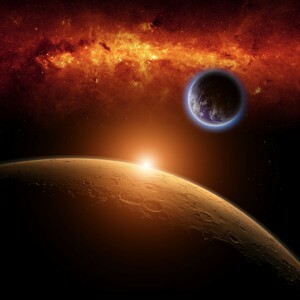 Ever since 1976, every new scientific discovery about conditions on the planet has been received by excited devotees as yet another confirmation that there must have been life on Mars. Some even went so far as to suggest that our Martian ‘cousins’ are still alive and well, and trying to contact us with elaborate markings carved onto their planet’s surface. NASA’s rebuttal of such theories, and its insistence that while the photographs taken by Viking 1 do indeed bear remarkable resemble to a human face, this is purely an optical illusion created by the play of sunlight and shadows on an otherwise normal hill, have only made the ‘life on Mars’ believers more dogged in their conviction. What’s more, they have also formed the basis for yet another conspiracy theory in which NASA plays the starring role. Ever sceptical of their national space agency, millions of Americans in particular, are convinced that the dismissal by NASA of what they believe to be clear evidence of life on Mars confirms that, as elsewhere, NASA is covering up the facts. After the amazing discovery made from the orbiting Viking 1 and its cameras, subsequent American and Russian missions ignored the discovery and instead focused on rather more mundane issues such as collecting physical samples from Mars’ surface and atmosphere, in an effort to gain a better understanding of its conditions. However, even serious scientists cannot completely dispel the distant glimmer of hope that this planet can or has supported life, but in their case this excitement is based not upon the ‘face’ and related features found on the Martian surface, but on the existence of water. 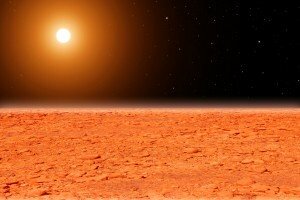 Rocks, sand and studies of the red planet’s atmosphere may have provided a rather downbeat picture of a world not much more useful and liveable than our own barren moon, but it is the existence of large polar ice caps and historic evidence of water that excites, because it does seem to indicate that life was once possible on Mars. Scientists may differ with the ‘life on Mars’ enthusiasts on the value of the ‘face’, but the discovery of an extensive network of what appear to be canals has led both parties to draw conclusions that are not that dissimilar. Naturally more hesitant to make bold statements than their excitable counterparts, the scientists point to these canals as one of many natural features caused by the drainage of water. Among these features they also include eroded rock formations such as that of the ‘face’. In fact, they believe that the entire region of Cydonia—the part of Mars where the ‘face’ was discovered—bears strong resemblance to river-eroded landscapes on earth, and that it once bordered an extensive ocean. It is not entirely impossible, then, that life forms may have existed during a warmer epoch, maybe when dinosaurs roamed the earth, but possibly even up to several tens of thousands of years ago. To assume that such life forms were, per definition, intelligent, and to regard the canals as an artificial irrigation system and the ‘face’ and other, rather obscure features gleaned from hazy photos as the monuments of an ancient civilisation, is more the realm of fantasy, says NASA. Yet many remain sceptical, pointing out that it took almost a generation for a new Mars programme to be launched. Indeed, after the initial probes into Mars’ mysteries in the 1970s, it took till the mid-1990s for a second wave of missions to get off the ground. Lack of funding, says NASA, but sceptics believe they merely wanted memories of the ‘face’ and other Martian revelations to die down. As if. If NASA scientists can master advanced physics and advanced theoretical mathematical models, surely they could predict that the launch of a new Mars programme would revive interest in what has become a controversy of Martian proportions. In the mid-1990s, an unmanned satellite was sent to Mars to provide a more detailed survey of our ‘neighbour’. The world held its breath; if NASA had been so dismissive of the ‘Face on Mars’ for over 2 decades, certainly now we would receive empirical evidence at last? The long journey ended, however, when a rocket misfired and the spacecraft spun out of control. NASA declared the mission lost, but for years rumours persisted that amateur radio buffs were detecting telemetry from the spacecraft. Once again, claims of a government cover up were rampant. Finally, in April 1998, the powerful Mars Global Surveyor was successfully put into orbit and it started beaming back more detailed images from the surface of Mars. When it passed over Cydonia and photographed the site where the ‘face’ had been discovered 22 years before, anticipation and excitement turned to disappointment and disbelief. Instead of the unmistakable ‘face hill’ photographed by Viking 1, Mars Global Surveyor recorded an uninspiring hill, which resembled nothing of the kind. NASA stated that these far more accurate images, devoid of illusions created by light and poor resolution, finally proved that the ‘Face on Mars’ was nothing more than an interestingly shaped hill, but once again they were accused of an elaborate hoax to cover up the facts. Claims were made that modern technology had been used to re-edit the photos and blank out the ‘face’, and that NASA had purposely taken the photos during the Martian winter, when misty conditions make photos blurry. The greater public, however, was satisfied when a new set of photographs, taken in the Martian summer, was beamed back two years later, yet the amazing clarity of those early images, coupled with all those mysterious waterways, continue to capture the imagination. Perhaps the only way to solve the mystery is a manned mission to Mars, but how can we be sure that that’s not going to be a hoax? Aarrrrggh, conspiracy theories…once started, they never end. This entry was posted on Thursday, July 24th, 2014 at 11:58 am	and is filed under Environment, General Interest, Travel. You can follow any responses to this entry through the RSS 2.0 feed. Both comments and pings are currently closed.